On September 13, 1995 Mr. Howard Guloien of Edmonton passed away. Since anybody bothered keeping records, there have been signposts in Edmonton's remarkable musical history; moments and events that caused great positive changes. They started pretty early in the 19th Century, and they still continue. One of them occurred in 1946, when the Trocadero Ballroom opened on the site of the former Empire Theatre. The big house band from the opening day was Bob Lyon and his Serenade in Blue. The Trocadero was a magnificent place. The balcony railings were in the form of musical staves, with the notes of the melody of Serenade in Blue etched on the lines. It immediately became the social centre of our city. Bob Lyon (Robert Lyon Rutherford) was a good and practical bandleader, as well as one of the proprietors of the Trocadero; and he knew that in Edmonton, which was regularly visited by the best of the big traveling bands, he had to have a band of first-rate musicians. So he imported a number of them, including the wonderful pianist Harry Boon. Harry immediately became a mainstay of Edmonton's burgeoning music scene. In those days, every radio station still aired live music in broadcasts from their studios, and Harry was heard (along with Ralph"Tubby" Mumford) regularly on CJCA. He played in the permanent band at the Trocadero of course, and came to be its leader when Bob Lyon retired from the stage to management. When CBC radio and television came to Edmonton, Harry was the main man. His excellent arranging skills and capacity to extract the very best from his sidemen made him the first-call pianist and bandleader in our city. 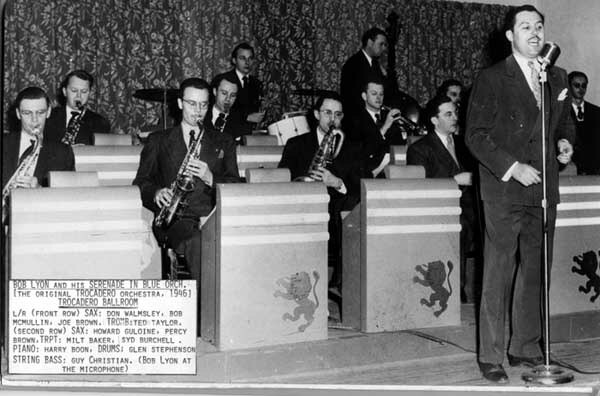 When the Glengarry Club opened, Harry took his band to that lovely and intimate club, where he stayed until it closed, continuing his broadcast work as well. Those of us who had the pleasure of knowing, moreso, the privilage of playing with HARRY BOON will be greatly saddened to learn he passed away on December 10th, 2006 in Kelowna BC. Harry, without any doubt, was a "musician's musician", a superb jazz pianist as well as capable of scoring commercial music on many radio commercials, etc. Harry was THE pianist around Edmonton during the era of the TROCADERO BALLROOM....he was there right from the very beginning when the Troc opened its doors. Harry had many radio shows on CJCA and the CBC Radio Network. In his later years, he "retired" to Vancouver. However he kept active in music and was always in demand. Notification of Harry's passing was relayed to me by his former bassist and friend of mine, Bud Sollitt of Salt Spring Island. I had met Harry during a couple of Tommy Banks' shows in the late 70's early 80's. A very nice man who was an excellent musician. I'm sorry to hear that he's passed.